The Needs and Offers database was created to help depository libraries with their collection management. As a FDLP member, discarding federal material is not performed autonomously. Libraries are required to inform the regional depository, and fellow selective depositories, regarding which titles they plan to discard to see if there is interest. Titles up for disposal will appear on the “Offers” list for 45 days before the library can discard the material. Libraries may also submit a list of titles they wish to obtain that will display on the “Needs” list. Librarians have the ability to toggle between the Needs and Offers lists. At the start of 2016, the Indiana State Library (ISL) updated the Needs and Offers Database. From the user end, not much appears different. ISL is working to make the database more efficient and easier for everyone to utilize. Lists are organized, and allow users to perform simple searches, by institution, SuDoc number, title, or agency. To ensure disposal lists are being uploaded correctly, ISL has requested librarians compose their lists using one standard format. Be sure you are using the new template with the Volume Information field. The Excel Template Standard can be downloaded about the bottom of this page or from the Needs & Offers database. If you use the older template, you will receive an error message when you try to upload. When compiling the offer list, include your library name, depository number, and date. When completing your list, start with the SuDoc number, Title, Volume Information, Publication Date, Authoring Agency, OCLC number, GPO number, and any Additional Notes (if needed). Please do not leave a space between the colon and the second part of the call number. Leaving a space will cause the sorting to be out of order. 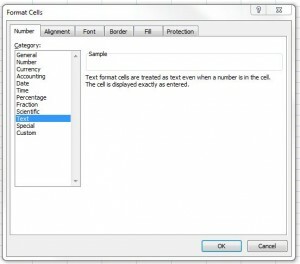 It is IMPORTANT to remember to save all cells in text format below you upload (including the date cell). Any cells that include a numeric format will cause an error message when you try upload your list. 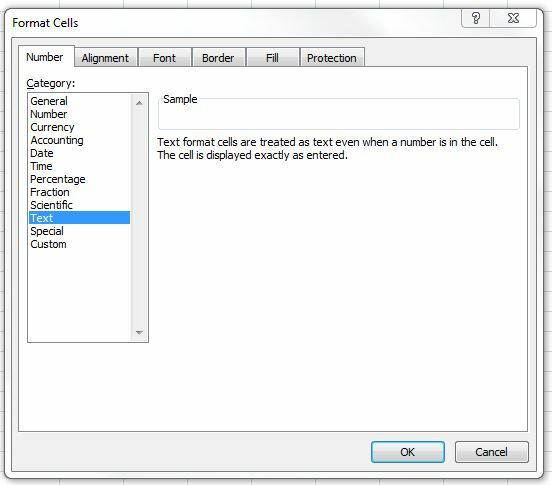 To ensure all cells are formatted to text, simply highlight all your cells (click and drag or hit Ctrl A to highlight all), right click, and select Format Cells. A box will appear, and with the Category listing select “Text” (you can click on the images to view in full screen). Another new feature to the Needs and Offers database is the ability for selective libraries to create their own password for their account. Previously, ISL created and distributed passwords for all selectives. Now, selectives can create their own password, or reset their password if need be. The new Needs and Offers database also includes a directory of participating libraries. The directory allows librarians to find fellow Indiana documents librarians, and allows libraries to update information when changes occur. As curators of a niche collection, being able to contact other documents librarians is a nice feature to use when seeking help to manage your own collection. If you have questions relating to disposal list procedures, please contact the federal documents coordinator (me! ).